You are at:Home»Forex News»Is EUR/USD ready for a downfall? Is EUR/USD ready for a downfall? EUR/USD is consolidating its losses and seems to drift lower. Markets are digesting the US NFP and bracing for further weak euro-zone data. The technical picture is mixed for the pair. 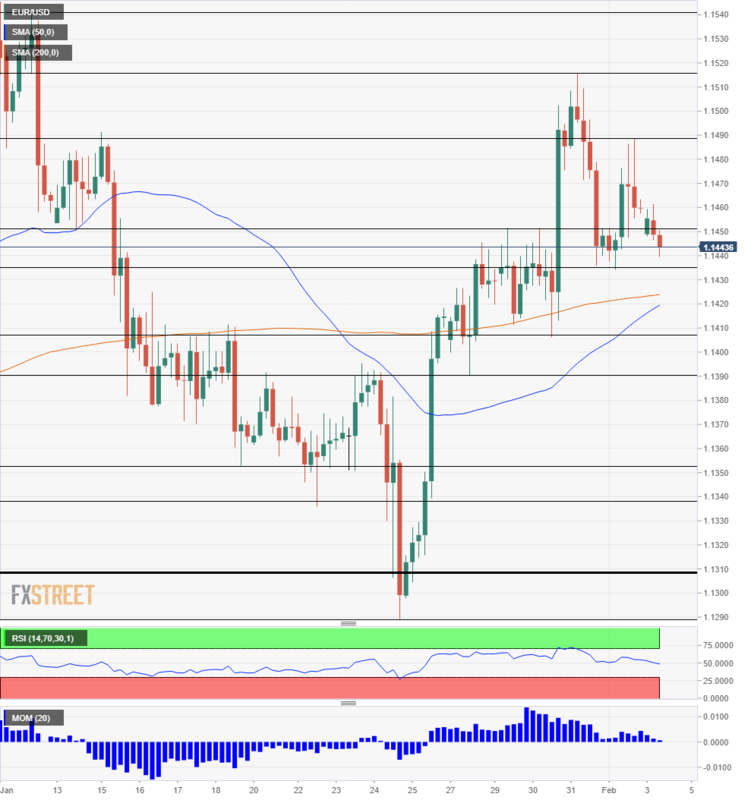 EUR/USD is trading in the mid 1.1400s once again, consolidating its losses. The pair topped 1.1500 last week, riding on the dovish Fed decision, but that has faded away. The US central bank paused its rate hike cycle and shifted gears to neutral, weighing on the US Dollar. They are also open to changing the balance sheet reduction program. The dovish message was welcomed by markets. However, the Non-Farm Payrolls report showed that the US economy is doing very well. Jobs jumped by 304K, and despite downwards revisions, the labor markets seem robust. Annual wage growth holds above 3%, showing further resilience and pointing to healthy inflation down the road. Moreover, the greenback remains the “cleanest shirt in the dirty pile.” Italy is now officially in recession, French growth is going nowhere fast, and Germany slashed its growth forecast. The German Bundesbank President Jens Weidmann expressed concern in a rare dovish stance from a hawk. The euro-zone Sentix Investor Confidence will provide a fresh update on sentiment among businesses in the old continent and will likely strengthen the narrative of the euro-zone losing economic momentum. US Factory Orders will be of interest as well, in an otherwise light day on the economic calendar. Trade talks between China and the US continue with the leaders of both countries planning a summit late in the month in Vietnam. Confirmation of a meeting between Presidents Trump and Xi could boost markets and move EUR/USD higher. EUR/USD is confined to a relatively narrow range. Support awaits at 1.1435 that supported the pair on Friday. 1.1450 capped the euro/dollar last week and is a soft resistance line. Further support awaits around 1.1420 where the 50 and 200 Simple Moving Averages converge on the four-hour chart. The next line to watch is 1.1405, a swing low last week. 1.1390 was a swing low in the previous week and is another cushion. The 1.1340-1.1350 region is next down the line. Looking up, the swing high of 1.1490 capped recovery attempts late last week. 1.1515 was the post-Fed peak and serves as another cap. 1.1540 and 1.1570 date back to early January. Upside Momentum is waning, like the euro-zone economy. The Relative Strength Index is also drifting lower but points to neither overbought nor oversold conditions. A fall below the 50 and 200 SMAs will serve as a bearish sign. Until then, we may see lost momentum but no quick downfall.